While it is true that exercises which require weights and machines to build up muscles are effective, the truth is that they are not always practical or expedient. For instance, some people have no time to go to a commercial gym and they may not be able to afford to buy standard exercise machines and weights to workout at home. However, here are some effective yet little known tips which will help you build muscles just as fast even without resorting to using weights or exercise machines. In the clamor to promote ever new exercise routines for muscle builders, many health and wellness experts forget to tell their pupils that ultimately; without taking the right nutrients, all those workouts are in vain. Muscles are made of proteins and taking a sufficient quantity will help you bulk even faster. The recommended daily protein intake for women is 46 grams while men need 53 grams. Pregnant women and those who are breastfeeding require even more proteins. Plank exercises are especially effective when it comes to strengthening and building up your chest and arm muscles. To perform a plank exercise, spread a yoga mat on the floor and lie on your stomach with your body held straight. Resting your weight on your forearms and toes, steadily raise your body and hold it up for fifteen seconds. Repeat this at least twice before resting. Gradually increase the duration of each plank up to a minute. An exercise ball can also be used to effectively build your core muscles by performing back extensions and crunches. To perform a back extension exercise, lie on your stomach on the exercise ball. Lift your body off the ball using your back muscles. Repeating the process for at least 15 back extensions daily should be enough. For crunches, place the ball beneath your lower back with the knees bent on the floor. You should then lift your back a couple of inches off the ball. A total of 25 extensions per exercise session are recommended for strengthening and building up your back muscles. Pushups are universally recognized as effective muscle building exercises and their simple yet intensive routine adds an extra measure of appeal. However, your body can adjust quickly to the stress produced by run-of-the-mill pushups making your regular routine ineffective in your bid to build up muscles fast. Some innovative wellness experts have realized that pushups can be made even more effective if they are performed while carrying a backpack. The amount of weight in the backpack will depend on your own needs and endurance. If you have been struggling to build up muscles, the cause of your frustration may not necessarily be lack of exertion but rather using ineffective means to achieve results. In fact, many people believe that you can only build muscles quickly if you invest in costly exercise machines and weights. 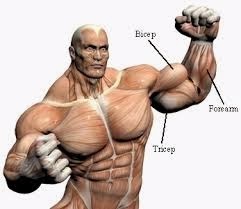 As the tips above illustrate however, you do not need to go to such lengths to build muscles fast.